The airport for the Haugeland region has the code HAU and is on the north east corner of the island of Karmoy, about 14 km (over a bridge) from Haugesund, 12 km from Kopervik and 33 km from Skudenes at the south end of the island. Stavanger is about 2 hours away to the south, Bergen is 2 or 3 hours to the north. There are about 14 flights each weekday, and about 700,000 passengers per year. Airport bus, taxis, car hire and car parking facilities. There are 3 to 5 airport buses to Haugesund (about 20 minutes, 50 kroner) with onward links by bus or fast boat to Stavanger and Bergen, plus other destinations. 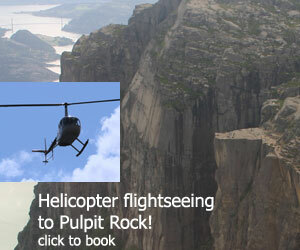 Coast Air (BX) has flights to Bergen, Sandefjord (Torp) and Fagernes in the mountains.